Rachel Jacob, NIU’s newly minted Student Lincoln Laureate, is the type of student who sets high goals for herself. Then she wildly exceeds them. Case in point. When history professor Beatrix Hoffman first met Jacob as a new freshman, Jacob said she hoped during her NIU career to land an internship in Washington, D.C., and study abroad. Like most NIU students, the Long Grove native hadn’t traveled much outside of Illinois. 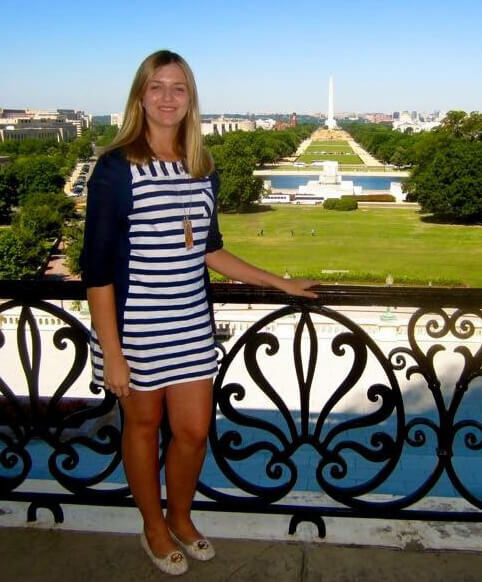 By the end of her sophomore year, Jacob had already accomplished a much longer list of amazing achievements and experiences that took her from DeKalb to D.C. to Indonesia. Throughout her NIU career, she squeezed every ounce out the opportunities that came her way—while also generously giving of her own time to fellow students and NIU. Being named as NIU’s Student Lincoln Laureate, or top senior, is no small feat in itself, with competition from a pool of the university’s most talented students. Annually, an outstanding senior from each of Illinois’ four-year universities is selected for the prestigious Lincoln Academy Student Laureate Award. It recognizes excellence in both curricular and extracurricular activities. 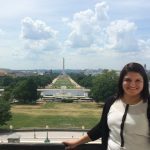 Rachel Jacob’s career at NIU included an internship in Washington, D.C.
She has served a total of three internships, including one on Capitol Hill with U.S. Rep. Robin Kelly. She twice won funding awards allowing her to study in Indonesia. The awards included an ultra-competitive Critical Language Scholarship from the U.S. Department of State that took her this past summer to the predominantly Muslim city of Malang, where she lived with a host family. Under the mentorship of Hoffman and political science professor Artemus Ward, Jacob also undertook three major research projects related to employment law and women’s rights. 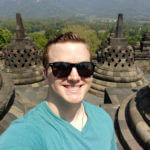 They resulted in U.S. Library of Congress archive work, a first-place award during NIU’s Undergraduate Research and Artistry Day, a position paper for Rep. Kelly’s office and a public presentation in Indonesia, which Jacob delivered in the Indonesian language. For all her accomplishments, Jacob credits others. In addition to her rigorous academic schedule, Jacob has embarked on a dizzying array of extracurricular and service activities. Just a few highlights: president of her sorority, Alpha Phi; Research Rookies peer mentor; and three years of elected service in the NIU Student Association, which serves as the voice of the student body. This year, Jacob is serving as SA president—the first female elected to the post in more than two decades. In that role, she is spearheading an initiative to recognize mental health challenges faced by young people and is pressing for creation of a scholarship for undocumented students at NIU. 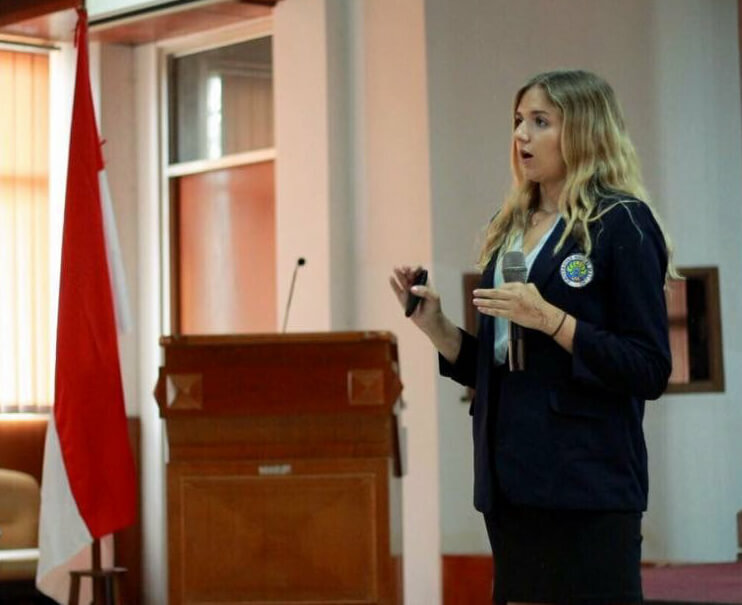 Rachel Jacob presents her research at Universitas Negeri Malang in Indonesia. Jacob says she looks back and knows NIU was the right decision for her. As a senior at Adlai E. Stevenson High School, she had narrowed her college choices to two schools and was leaning toward the other before she came for a visit to NIU. 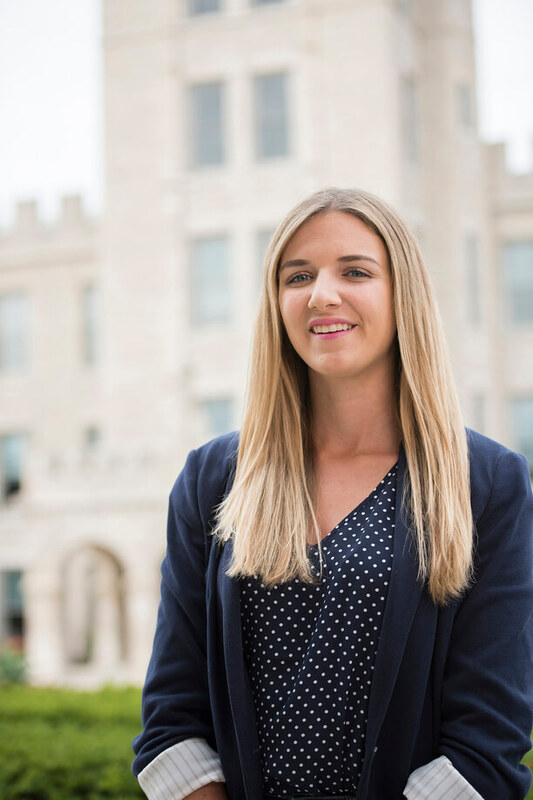 At NIU, she found faculty mentors who pushed her to excel, including former political science chair Matt Streb and federal relations director Anna Quider, who supervised one of Jacob’s internships. Jacob is currently applying to top-tier law schools and hopes to someday work as a U.S. Department of State foreign services officer in Indonesia. Her Student Lincoln Laureate Award will be presented Saturday, Nov. 11, during the annual Student Laureate Convocation at the historic Old State Capitol in Springfield. 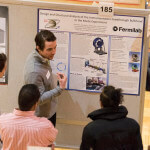 Other nominees for the NIU Student Lincoln Laureate included first finalist Drew Donnally (chemistry), finalist Wataru Hashimoto (applied physics), Erin Hernandez (international politics and Spanish) and Sydney Johnson (corporate communications and community leadership and civic engagement).